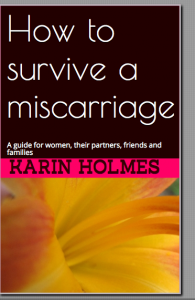 My book “How to survive a miscarriage” is a self-help book, with a little attitude. It is a guide for women who suffered a miscarriage before week 20 of their pregnancy and provides hands-on support for life after loss. The book addresses various areas of the grief journey through miscarriage such as rituals, dates to remember and how to get through a new pregnancy. My book recognises a miscarriage as a real loss and aims to encourage women to acknowledge the hardship that follows the loss of a baby and take control over it. It aims to show them how to find strength in themselves when no one else seems to care and that they are entitled to a proper grief journey. The book is written in two parts, ending with an epilogue. ‘Part one – how to survive’ covers life immediately after loss, and it entails ideas for coping with loss, rituals, important dates, a discussion about acceptance and other topics. Part two is called ‘let’s get physical’ and provides facts about miscarriage. Considering miscarriage in early pregnancy is looked at by society as insignificant, I have included a whole section on advice for others – friends, family and partners – and how they can cope with such a tragedy. Part two ends with discussing body issues like self-image and physical recovery and how to regain confidence in yourself after this life-changing event. My name is Karin Holmes, I am Swiss born but live in Australia now. Love brought me here as I met my husband while travelling. I am a trained journalist and writing has always been my passion. I was terrible at maths, even in primary school, but loved to write stories, short and long, from the moment I knew how to write. My other passion always has been reading – to get lost in a book, get involved with the characters, cry a little tear when a beloved character died, that is my kind of thing to do! I also like to do some painting although I am no good at it. But it is a fantastic skill to have when having to entertain children! We have two girls and one boy in heaven. I lost my very first pregnancy to a miscarriage and to say this terrible event shook my world upside down is an understatement. It was beyond awful. To try and deal with my grief, I turned to writing. First just for myself to try and make sense of my emtions. But piece by piece, and after talking to many women who experienced the same type of loss, a book came together. I wrote it in the hope to help women out there who also lost a baby too soon. It might be an early loss but it is a loss, a death and it needs to be dealt with, despite society’s often flippant attitude towards miscarriage. I hope I can get the word out there about my book and hope it will reach people in time of need and can help them along their grief journey.